Join the discussion on our forums! Come discuss Unleash the Beast over in our dedicated Unleash the Beast discussion topic. This card is *so* good in midrange hunter. If you cast 4 wyverns and 2 dire frenzy before zuljin: 4 wyverns came on board, you probably shuffled 3 somethings into your deck and maybe 3 8/8 wyverns with rush. 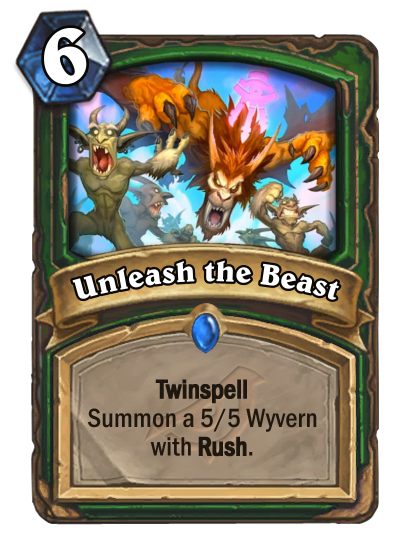 once you play zuljin, he will: summon 4 wyverns and probably 2 animal companions, most likely cast another dire frenzy on a wyvern, shuffling some more 8/8 rush into your deck, and in addition you hold 2 more unleash the beast twinspell copies in hand! and be aware that especially an 8/8 with rush is a) a flexible removal and it usually leaves a threat behind that your opponent really needs to deal with. You know, Blizzard, Zul'Jin was my favorite character ever since Warcraft 2. How he'd always roar for his people, even with his dying breath. Seems meh until you realize twin spell copies will go back into your hand when you cast Zul'jin.